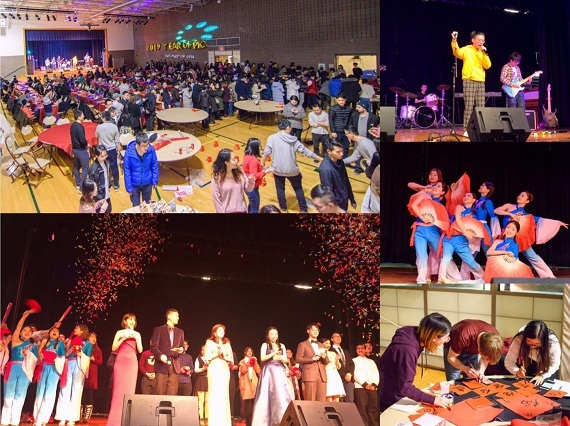 On February 10th, 2019, Northwestern University successfully held their 2019 Spring Festival Gala. The event was hosted by Northwestern’s Chinese Students and Scholars Association (CSSA). Northwestern’s China Affairs Liaison Professor Gu Licheng, and representatives from various offices, such as the International Students and Scholars Office, were in attendance. More than 400 Chinese and American students and scholars from Northwestern University and other Chicago universities also attended the event. Counselor Chen Yinghui and Deputy Consul Liu Jiaming of the Chinese Consulate General in Chicago were invited to attend the party. Counselor Chen Yinghui opened her speech by sharing with Northwestern’s Chinese students New Year greetings from the motherland. She then reassured the students that the Consulate General will always be their second home and hoped everyone makes great strides academically and complete their study abroad experiences safely and successfully. The event was lively and drenched in the thick atmosphere of holiday joy. In addition to Northwestern University’s own students, those from other major Chicago universities, such as University of Chicago, Columbia College, School of the Art Institute, DePaul University, and Loyola University, also brought two hours of wonderful performances—rich in content and varied in form—to the stage. Displaying an entertaining blend of traditional and modern acts, these talented Chinese students engaged the crowd with cross talk comedy, dances, and instrumental performances. Off the stage, everyone filled their bellies with Chinese food and partook in traditional Spring Festival activities such as composing couplets and gifting each other with calligraphic “Fu” (Chinese character for good luck). All in all, though these students are an ocean’s blue away from home, the evening’s event warmed their hearts with the familiarity and pure bliss of the New Year.